Birthday celebrations, holidays, and countless school or extracurricular activities in between children’s social calendars can seem like endless fun, until you realize they can also translate into a non-stop, cavity-inducing sugar high. This doesn’t necessarily mean, however, that your child is destined for a long list of dental problems. Use this dental cheat sheet when a special occasion arises to keep his or her smile cavity-free. Keeping instructions simple, yet clear can make it easier for your child to adopt these rules without any hassle, and help him or her stick to the guidelines even if you are not present. Not all sweets are equally damaging to teeth, so helping your child to make smarter choices can have a big impact on the amount of sugar he or she eats. 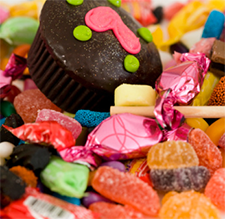 Prolonged sucking on hard candies, for instance, is one of the most harmful ways to satisfy a sweet tooth because of lengthy, direct exposure of the tooth’s surface to concentrated sugar. Likewise, sticky foods that contain ingredients such as caramel or toffee are more likely to get lodged in between teeth, and chewing on them may even result in a lost filling. If or when possible, steer your child towards cakes and cookies instead. While these desserts are still refined carbohydrates that will break down into sugar, the amount of contact with harmful acid is significantly less than with candies and other stickier treats. Make it easy for your child to opt for something nutritious by packing a healthy alternative. Cheese, for example, is calcium-rich and can help remineralize tooth enamel. Many manufacturers now offer single-serve packages for convenience when on the go. An apple is another tooth-healthy option when chewed, its high fiber content makes it an excellent “plaque scrubber”. Even sugar-free gum can do the trick if it contains xylitol, which can help prevent the growth of oral bacteria. Ultimately, maintaining good oral hygiene is the most effective thing parents can do at home to help keep their children’s smiles healthy. If you’re always on the go, it may be worth packing a travel-sized toothbrush, but if your child forgets to brush amidst all the excitement, make sure he or she does so upon returning home. Flossing is just as critical, and nowadays, there are many options that parents might find to be more “kid-friendly” – such as water flossers or interdental brushes. At minimum, your child should be brushing and flossing twice a day, but don’t hesitate to add another round of cleaning if he or she has had a particularly rich meal. Last, but not least, make sure your child visits the dentist at least twice a year (or as advised by the dentist). In addition to receiving a professional cleaning, your child’s dentist can look for developing decay and gum disease, and treat it before it becomes more serious. He or she can also help ensure your child is practicing the correct brushing and flossing techniques, and provide teeth additional protection in the form of dental sealants, if need be. Perhaps the easiest way to teach your child how to protect his or her teeth is to lead by example – and doing so not only benefits him or her, but your oral health as well! Follow these tips together with your child, and consult with your child’s dentist for additional ways you can make dental care a simple and even fun experience for your child.